The days are noticeably longer now. For the first time since September, it�s light when we go to work in the morning. Sadly, for reasons that nobody understands, the increasing brightness always brings a rash of suicides to village Alaska. Often, the victims are teenagers. One of our mission�s objectives is to help put a stop to these needless tragedies. Please pray for all involved, won�t you? And thank you so very much for your prayers and support for our work. SIDEWALK SUPERINTENDANT (left): March 12th, Nome�s Front Street is bare of snow and ice but the sidewalks aren�t cleared, so Iditarod racer John Baker takes to the walkway about one-third mile from the finish line, followed by cheering children. Baker finished the race third, about seven hours behind winner Martin Buser. The Black KNOM truck is behind Baker, with Florence Busch and Julia Arrotti reporting his location for listeners. From the healthy and happy appearance of these dogs, you would never imagine that they had just run 1,112 miles in nine days. KNOM broadcasts the arrival of almost every team, around the clock, for about a week. It�s a time of extremely high listenership, with inspirational and educational spots sprinkled among race coverage. INSPIRATIONAL SPOT: The best way to get even is to forgive. INSPIRATIONAL SPOT: Rank does not confer privilege or give power. It imposes responsibility. 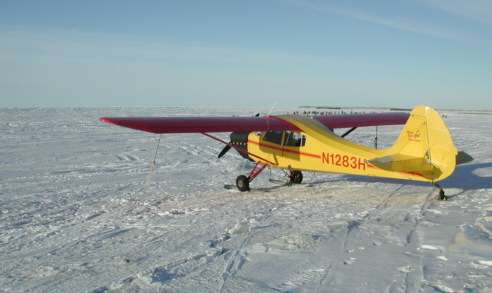 KNOM�s Iditarod Race pilot George Murphy stands alongside his Aeronca Sedan, parked on the ocean ice near the Nome post office. George is an extremely accomplished and careful pilot. 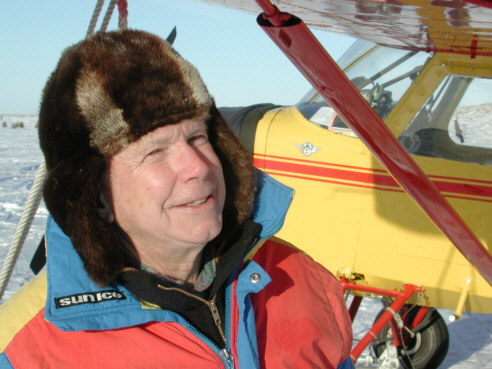 From Willow, Alaska, George has flown KNOM reporters along the Iditarod Trail for fifteen years. 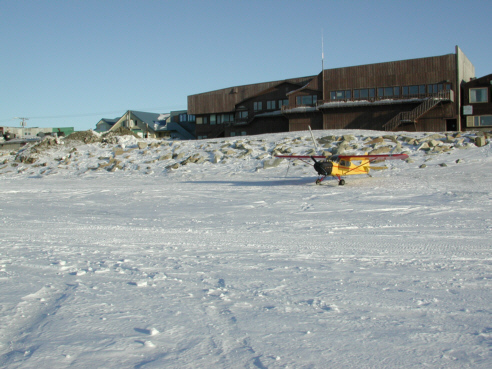 (Left) Two views of George's Aeronca, looking out to sea, and looking toward Nome's seawall. This year, KNOM news director Paul Korchin shared George�s single-engine plane with Associated Press reporter Maureen Clark and AP photographer Al Grillo. As has happened before, Mike�s in heady company. Another winner was ABC reporter Connie Chung for a radio program examining how children are dealing with the September 11th terrorist attacks. Mike is assembling permissions to reproduce some of these stories for sale, and we hope to have a cassette or compact disc available within a couple of months. Thank you to everyone who has asked to hear these remarkable programs. NOVENA: Thank you to village pastor Fr. Tom Provinsal, SJ, who assembled and recorded material for the St. Francis Xavier Novena of Grace, which KNOM inspiration director Lynette Schmidt produced, and which aired in early March. INSPIRATIONAL SPOT: Sometimes the Lord calms the storm; sometimes He lets the storm rage and calms His child. top THIRTY YEARS AGO: March 21st 1972, the first day of spring, Nome�s thermometer leveled out at -32º. YOUNG AND OLD: Every two years, local leaders organize a massive conference which calls seniors and young people from Nome and a dozen villages to discuss solutions to some of the region�s many serious problems. This year�s gathering was titled �Uniting Two Worlds Through Education for a Healthy Tomorrow.� Money is scarce here, and only a handful of people can attend from each village. Thanks to your help and support, KNOM broadcast 12 hours of the dialog, giving every person for hundreds of miles a front row seat. IN A �SECOND:� (left) Light snow fell last year as KNOM general manager Tom Busch pointed the shotgun microphone toward Linwood Fiedler�s dog team and the crowd. 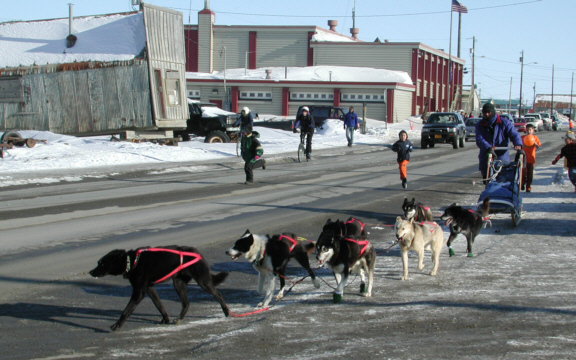 Fiedler crossed the Iditarod Race finish line in second place. A popular musher, Fiedler took his team out of the 2002 Iditarod just past the halfway point. His dogs had become ill, due to either a virus or some kind of food poisoning. 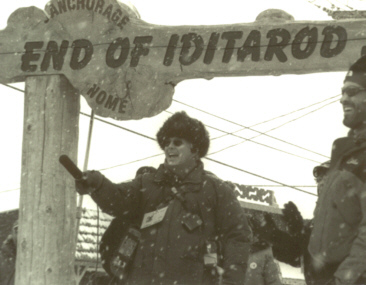 You�ll see a KNOM mike at virtually every Iditarod finish, as dog teams trickle into Nome over a week�s period, 24 hours a day. We prayerfully deposit all bequests into funds that are used for major capital improvements or for future emergencies. Thank you! INSPIRATIONAL SPOT: Ask a miser how much money he has...he knows to the penny. Gifts from such a person come with the expectation of something in return. A mother can�t tell you exactly how many times she hugs and kisses her child. Who can measure such things? Love cannot be counted or calculated. God the Father gave us His Son, despite the cost. INSPIRATIONAL SPOT: A man dreamed that he was walking down the road carrying a sack of rocks, with rocks in his arms and in his hands. The Lord asked what they were. The man replied that they were memories of families and friends as he was growing up. And the Lord showed him how perfectly they all fit together. top A MAN WITH ISSUES! KNOM volunteer Ryan Conarro (left) produces daily 5- to 10-minute features, on a variety of topics. Recent subjects include: Fetal Alcohol Syndrome, gold deposits, Russian Eskimo ivory carvers, juvenile justice, beach erosion, and a host of issues related to native culture. One March series was �Technology in the Bush,� discussing Internet access and satellite television, and how they affect Native culture and tradition. �Technology in the Bush� culminated with an interview with Alaska Native Barb Pungowiyi. (pung-GAHW-ee). 49 years old, she�s coordinator of Native Programs for Nome Public Schools. �I don�t think there�s anything wrong with technology,� Pungowiyi said over KNOM. �We want to share our tradition with everyone, and we are grateful to others who have shared their culture with us, and to me that includes technology. Some might say technology is one of the reasons why our culture is being lost, but I think it can be used to an advantage. LOTS OF �AIR� TIME: KNOM program director Ric Schmidt is secretary/treasurer of the Alaska Broadcasters Association, which sent him this past month on lobbying trips to Washington, DC and Alaska�s state capital of Juneau. By the way, our capital city is not exactly around the block. From Nome, Juneau is 1,089 miles, about the distance between Albany, NY and Tampa, FL. General manager Tom Busch, a twice past president of ABA who remembers how grueling those trips can be, was the one person on the staff who wasn�t envious of Ric�s getting away from the Arctic for a few days in the middle of winter. Once again, we thank you most sincerely for your help, which keeps our work for the Lord alive and strong. May He bless you a thousand times over! INSPIRATIONAL SPOT: God, I do not know where you are leading me. I do not know what my next day, my next week or my next year will look like.